Playing at war online can be a lonely place on XBLIG. Pick any game and it’s an epidemic, even for new releases. The majority of the service’s already-infinitesimal audience is scattered between a handful of popular titles, with the rest of the online games left to fight for stragglers, or, sadly, abandoned altogether1. Rendercode Games‘ newest, Assault Ops ($1.00), is no exception. Not that you’re missing out on much excitement here. Assault Ops is a twin-stick online shooter, featuring your typically-generic combatants / weapons, but an atypical isometric view. You can choose from a handful of soldiers, with only slightly-varying stats. One might have more agility, while another boasts higher firepower. Really though, the differences are cosmetic, as they (and the guns) all play the same. Defeated foes drop health packs and ammunition, ensuring you’re always topped out after each confrontation. The online component is a nice option to have, but it’s exceedingly-basic and as generic as its character choices. It supports up to eight players, in a Deathmatch or Team Deathmatch scenario. Tweak the score conditions for victory, or the amount of time on the clock for each round, and that’s about it. Unfortunately, you’ll likely never find a match or other players online2. The game does offer A.I. bots in place of human competition, ranging from Easy to Hard, and this will probably be your only means of trying out the game. Four soldiers on-screen at once!? Never happens. Assault Ops has just one arena, albeit a very large one, with plenty of buildings and and corners to peek around. Of course, that size works against it as well. Given the length of the map, and the pseudo-intelligence of the A.I., you’ll wander for a bit between the (almost entirely) 1 vs. 1 firefights, eventually stumbling onto an opponent, or they you. The isometric camera doesn’t give you the longest of sightlines, either, making it hard to spot threats until they’re practically on top of you. You may prefer those odds in a straight fight, but don’t expect any massive battle of wills or heavy firepower. Otherwise, Assault Ops plays fine, and controls well enough. It just doesn’t do anything new or interesting, at all, and the complete lack of a community means you’ll be fighting this war all by yourself. You have to admire persistence. Rendercode Games has been on a mission to create a Slender-like worth playing for more than a year now. First there was the dreadful The Monastery, followed up by a an FPS / Collection hybrid that just didn’t work, Hellhounds. Whether this game is the product of that constant iteration, listening to criticism and adapting, or something else entirely, that dogged persistence to Slender-ize has now paid off. Somewhat. Avatar Fear ($1.00) is still just plain boring as a solo act, but in teaming up with four friends (or randoms, even) online, it’s a bit of alright. Switching the traditional perspective to a third-person view, Avatar Fear drops you on a large map containing a number of Mayan temples and buildings, some you can enter, some not. You’re asked to collect a certain amount of coins— ranging from 10 to 24 depending on the difficulty chosen— with the knowledge that an ancient monster (er… a giant lizard with wings and tiny human skulls for a belt) will be stalking you and / or your crew the entire time. Bet you regret that decision to visit ancient ruins1 now, don’t you? Conveniently, your avatar walks very slowly (to dial up that tension, natch), but you do have a limited ability to run, essential in escaping the monster. In multiplayer, your endurance is wisely tied to that of your teammates. If you don’t stick close to the group, you won’t be able to run as far when the creature picks up your scent. This also means you shouldn’t cast too wide a net in your search, as lone-wolfing it is a surefire way to get yourself killed off early. There’s no real way of dealing with the lizard when it appears, or defending yourself if you’re caught out. You simply have to run, hopefully finding a corner or building to duck into, breaking the line of sight. Even then, you’ll have to mumble a prayer and hope it gets bored with the chase. You can also, in effect, throw your partners under the bus and walk away, leaving them to ditch the monster or suffer a cruel fate. Upon death, you turn into a ‘ghost’ camera of sorts, and can watch the survivors search for the remaining cash. Similar to White Noise Online, playing what should be a scary game with others doesn’t dilute the fear as much as it makes things more fun and genuine. Having others conduct their own search while you do yours cuts out a lot of slow busywork, and it’s certainly a little unnerving to look up and see the distant glow of your friends’ torches, and realize you wandered a bit too far. Then the music starts, and its too late. The reverse is also true, as being the last alive means your name is next on the list. Still, was I able to find the final two coins, play the hero, and bring down the lizard king’s evil grip on… fictional ancient currency? You bet I was. Shame the global leaderboard only tallies scores made during the duller solo runs, but I digress. It still pales next to the likes of White Noise Online and, you know, the actual Slender, but Avatar Fear is quick entertainment for a group of people that aren’t afraid of the dark. Or giant, stalking lizards with skull belts2. Oh, Rendercode Games, didn’t we just do this a month ago? Well, somewhat. Rather than awkwardly-animated hellhounds, this time we’re treated to more-convincing mummies, once again pulling antagonistic duties in your standard wave shooter. Mummies Rising ($1.00) thankfully forgoes the Slender-style collection minigame that plagued Hellhounds, in an attempt to have things play out more like a straight-up FPS: Shoot first, and shoot second. Which it does, throwing four visually-different varieties of wrapped-up undead at you to perform your best Brendan Fraser impression, spread out over ten waves / levels and using the same tried-and-true weaponry. The guns you’re allowed to outfit with alternate over each stage, ditto the amount of enemies you have to kill before advancing to the next… and you’ve seen and read this all before. Level layouts are limited to two types; the corridor-like shooting gallery, where you simply walk straight ahead picking off targets, and the typical arena format, forcing you to branch out into the pervasive (and very effective) darkness to hunt down your objectives. 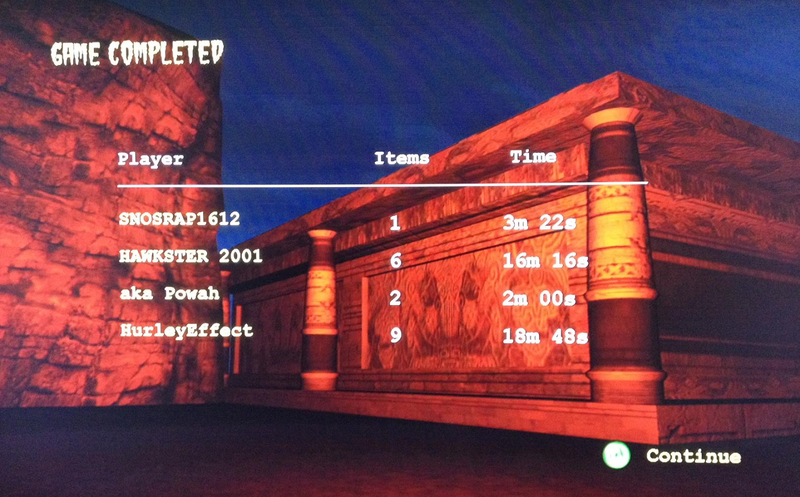 The level design alternates with each wave, although the Egyptian textures and art style are rather well done here, which helps to somewhat mask the repeating layouts. To its detriment, Mummies Rising keeps the molasses-slow movement speed that its predecessors implemented. This isn’t so much of an issue through the first three-quarters of the game, as your enemies are naturally the slow, shambling type, though it does present problems in the last few levels. That’s when a faster enemy type is introduced, leading to instant death (and a more-or-less impossible final level) whenever you’re attacked by a larger group. Even putting aside the slow movement and unfair finale, though, Mummies Rising is your average first-person shooter. It looks great, but the game recycles the same staid objectives and brain-dead AI, taking no risks, offering no thrills.